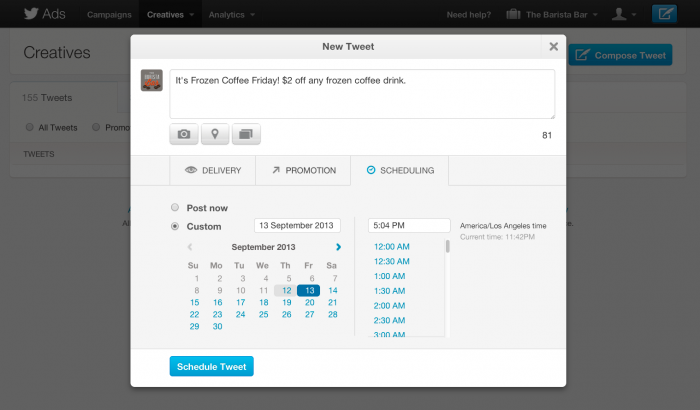 Twitter today announced it is rolling out a scheduled tweets feature to its Ad Products. This isn’t an English-only release: scheduled Tweets are available to Twitter Ads users in all supported languages. Twitter says scheduled tweets can be coordinated with new or existing Promoted Tweet campaigns. That being said, scheduled tweets can be Promoted as well as organic, meaning this isn’t limited to tweets that businesses specifically pay for. As you can see in the new tweet box above, tweets can be scheduled based up to one year in advance, in increments of one minute. The time you choose is based on your account’s timezone. Scheduled tweets can be created and scheduled from the blue Tweet button on the top right corner of the navigation bar at ads.twitter.com. Twitter is also introducing a new Creatives tab (in the top navigation bar next to Campaigns and Analytics) for users to create and manage both scheduled tweets and Twitter Cards in one place. With scheduled Tweets, you can publish content at any time without having staff on-call to Tweet on evenings, weekends, holidays, or other inconvenient times. Advertisers also gain the flexibility to plan content in advance for events like premieres and product releases. Other than the new scheduling options, advertisers still compose tweets in the same way as before. They can still choose to add a photo, location, or card. They can still choose organic versus promoted, as well as specific targeting criteria.